Samantha Gitlin, age 6½, ropes a bull. Samantha Gitlin, age 6½, Howard Drive kindergarten student gleefully hurls her lasso towards bullhorns. Twenty other elementary kids race between hiding places with laser tag guns in hand. Jackson Margulies, age 8, from Ms. Russell’s 3rd grade class, launches into space, while hundreds of others dart between the fair booths creatively themed by each teacher. Held on April 1, this was no April Fools’ joke. It was none other than the annual Howard Drive Elementary Fun Fair. Delayed from February because of a rainy day, this day turned out to be spectacular and better attended than expected. 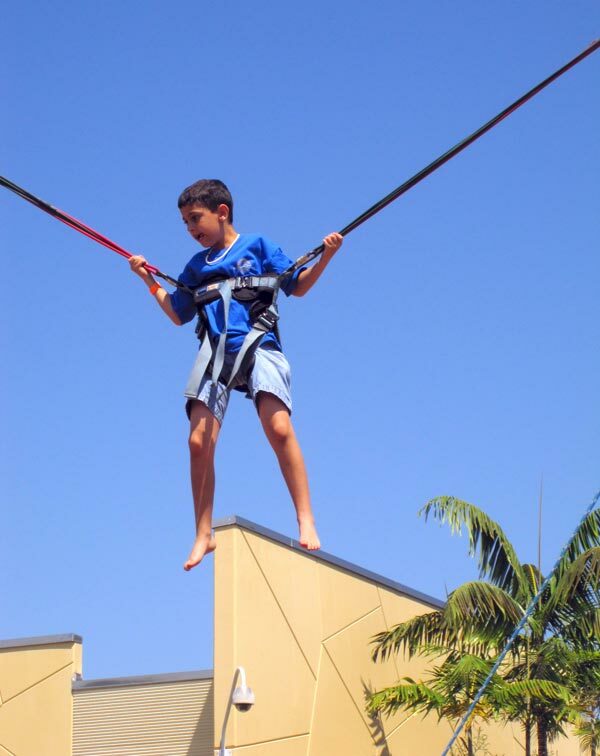 Jackson Margulies, age 8, briefly soars above the school. Money hits the tills at the Howard Drive Elementary Fun Fair. The event raised about $20,000 this year and goes to support programs all year long throughout Howard Drive Elementary.